Douglas Emmett wants to build a three-story office complex inside its Warner Center office campus, continuing the wave of new development in that area. The new construction would represent the focal point of Douglas Emmett’s repositioning of its 360,000-square-foot campus. 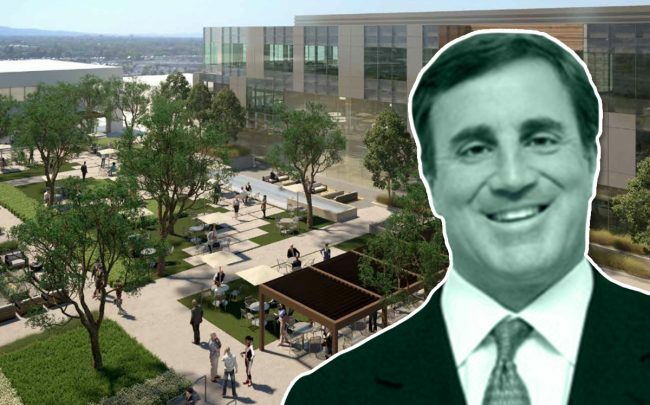 The Santa Monica-based developer filed paperwork for the 67,000-square-foot property, which would replace an existing low-rise office at its Trillium campus at 6300-6320 Canoga Avenue. Douglas Emmett will build out office space to tenant specifications and offered examples of floor plans for a traditional office and a creative office, according to its marketing materials. Four other buildings make up the campus — two 17-story towers and two retail spaces. The campus is centered around a recently renovated private courtyard. Next door there’s a Hilton hotel. The campus sits near the center of the Warner Center area, an 1,100-acre zone Los Angeles wants to turn into a walkable downtown district with its Warner Center 2035 master plan. The master plan, adopted in 2013, includes adding both commercial properties and residential units. The city estimates that the area will see 24,000 new units and 28 million square feet of new commercial development by 2033. Developments now in the works include Bolour and Associates’ residential project on Oxnard Street and California Home Builders’ Q West and Q East mixed-use developments. But none of the 2,500 residential units approved in the area since 2013 is considered affordable. Local City Councilman Bob Blumenfield asked city staff last year to study ways to spur affordable housing development.